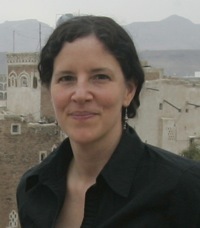 Director Laura Poitras’ documentary “The Oath” is the second installment in a planned trilogy that includes her previous film “My Country, My Country” (2006), which was nominated for an Academy Award, Independent Spirit Award, and Emmy Award. “The Oath,” which is screening as part of the Sundance Film Festival’s U.S. Documentary Competition, “is the interlocking drama of two brothers-in-law, Abu Jandal and Salim Hamdam, whose associations with al Qaeda in the 1990s propelled them on divergent courses. I guess what lured me into filmmaking was spending as much time as I could growing up in movies theaters. There is still no place I’d rather be than watching a movie in a dark room with a bunch of strangers. I’m aware that the industry is looking for new models to distribute indie films, and that the model of theatrical distribution is in jeopardy, but the idea breaks my heart. I was first interested in making a film about Guantanamo in 2003 when I was also beginning a film about the war in Iraq. I never imagined Guantanamo would still be open when I finished that film, but sadly it was – and still is. Originally, my idea was to make a film about someone released from Guantanamo and returning home. In May, 2007 I traveled to Yemen and that’s where I met Abu Jandal, Osama bin Laden’s former bodyguard, who drives a taxi in Yemen. I wasn’t looking to make a film about al Qaeda – I really wanted to tell the story of someone innocent returning from Guantanamo, but the story changed when I met Abu Jandal. “The Oath” director Laura Poitras. Image courtesy of Sundance Institute. In addition to working as bin Laden’s bodyguard and guesthouse emir, Abu Jandal was responsible for recruiting his brother-in-law, Salim Hamdan, to Afghanistan. Hamdan was later captured in Afghanistan and sent to Guantanamo. He is the film’s “missing” protagonist. His story unfolds in his absence. Themes of family, guilt, betrayal, regret, loyalty, absence, etc, are not typically things that come to mind when we imagine a film about al Qaeda and Guantanamo, so the story compelled me. It was a way to grapple with the traumatic events of the past nine years on a human level. Although I met Abu Jandal early in the filming, it took a long time to shoot the film. I rented a house in Sana’a (the capital of Yemen), and spent 2 years traveling back and forth. In Yemen, I worked with journalist/co-producer Nasser Arrabyee. The approach was patience and trust. If I were on assignment, I would have been fired long before the film could have been shot. Although there are lots of “big themes” in “The Oath,” in the end, it is a psychological study of Abu Jandal. The complexity of this portrait and how it unravels is a testament to the work of editor/co-producer, Jonathan Oppenheim. With Hamdan’s story, we wanted to evoke the emotional pain of his absence. This was important not just for this story, but also for the bigger issue of Guantanamo. DP Kirsten Johnson found ways to evoke this emotion in images of absence. If I have one goal in this film, it is to make audiences feel the emotional impact of Guantanamo. This is definitely the hardest film I’ve ever worked on. Working in Baghdad was much easier by comparison. The sensitivity of the issues in this film added a level of stress and anxiety that I’ve never experienced. Everyone who worked on the project took on this intense pressure. I don’t know what to expect. “The Oath” touches on many political and psychological nerves, and it is hard to know how it will be received. I hope it opens a space to grapple with issues that have been too narrowly defined on all sides of the debate. As a nation, I don’t think we’ve begun to come to terms with 9/11 and its repercussions (Guantanamo, the invasion or Iraq, legalization of torture, etc.). I read a lot of DeLillo while I was in Yemen. The anti-hero and terrorism themes in his work were appropriate company. During editing, I saw a retrospective of the Dardenne brothers at the FSLC, which reminded me to trust the intelligence of the audience. I plan to make a film about the 9/11 trials. It will be the third film in a trilogy (following “My Country,” My Country” and “The Oath”) about America post 9/11. I’m also working on a project to gather documents and artifacts from Guantanamo.